Galesburg Speedway Closes it’s gates! It is with extreme disappointment that I pass along to you that the Warning Family has closed the Galesburg Speedway for the remainder of the 2011 Racing Season. According to the track’s website, the track has not been sold or leased and it is being closed due to economic conditions at this time. Galesburg was built by the Beebe family back in 1947 and had been continuously providing racing action for all these years. Many big names and Michigan Motor Sports Hall of Fame members have come from the tight little 1/4 mile oval over the years and it truly is a sad day to see the history from Galesburg stop for the time being. This doesn’t mean the speedway is done but like many other facilities these days were struggling with car and fan counts, which make it impossible to continue in these depressed economic times. 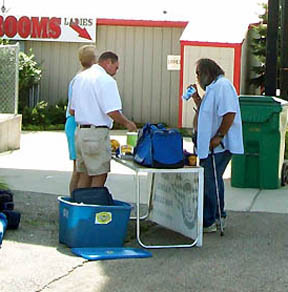 Galesburg is owned and promoted by the Ralph Warning family and they have poured their heart and soul into the facility and have been loyal members and attendees of the Michigan Speedway Promoters Association. In addition, the Speedway has been a long time member of the Michigan Auto Racing Fan Club and with that said, I will miss our regularly scheduled MARFC Day that was to be held on August 13, 2011. Please, as loyal MARFC Members, get out to a track somewhere that day and support them so that we as race fans, racers, and a community do not see anymore of our beloved playgrounds shutter the doors. 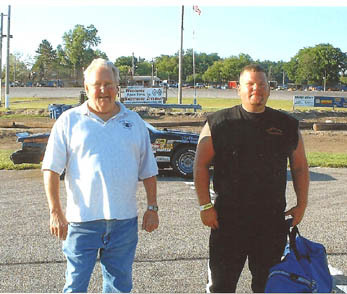 On behalf of all of the members of the Michigan Auto Racing Fan Club I want to say Thank You to Ralph, Ryan, and the entire Warning Family for all the support they have shown us over the years and we pray that 2012 can bring a re-birth to the Galesburg Speedway. MARFC Travels to Whittemore Speedway! On Saturday July 16th was our second time at the Whittemore Speedway and what a night it was with some great racing. Club Members Don & Nancy Rathbun as well as Barry Meschke volunteered to take care of the MARFC Member table and presented the MARFC Helmet Bag to Rich LaFleur who just recently took home his first feature win and also won the Australian pursuit that night. Rich is very dedicated to the track and the fans of the Whittemore speedway. Jack Colpean Sr. was the MARFC Raffle prize winner. Thanks to Andy Hess and the Board of Directors and staff at the Whittemore Speedway for being a part of MARFC and having us out for some great racing action up in God’s Country. On July 15th we made our first trip to the M-40 Speedway over in Jones, Michigan. Kevin and Tonia Koscher have a wonderful facility and put on a great show for the fans. 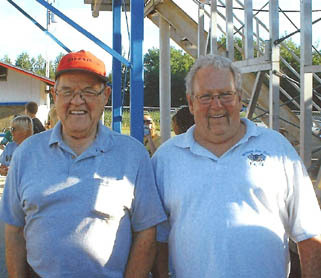 Dennis Schalm accompanied me to the speedway which saw Gene and Linda Hurd win the MARFC Raffle Prize. We had over a dozen members sign in for the first time at the speedway which was a great turn-out on a very hot Friday night. Welcome aboard Kevin and Tonia.